Summer is synonymous with water fun, a time to enjoy community, hotel and resort pools, hot tubs and waterparks. But what are the risks associated with these aquatic facilities? This spring, the Centers for Disease Control and Prevention (CDC) provided an update on swimming pool waterborne disease outbreaks in the US. What did CDC find, and what do their findings mean to the water-loving public? First, we learned from CDC that between 2000 and 2014, there were nearly 500 reported illness outbreaks1 in 46 states and Puerto Rico causing over 20,000 cases of sickness and eight deaths. CDC data show the majority of outbreaks with known causes from waterborne pathogens could be traced to the chlorine-resistant parasite, Cryptosporidium. “Crypto” (not to be confused with “cryptocurrency,” which is a whole different story!) causes diarrhea and is spread through fecally-contaminated water. For recreational waterborne diseases, this happens when infected (and previously ill) individuals patronize aquatic facilities. Such individuals have the potential to contaminate water for at least two weeks after experiencing diarrhea. The parasite, which can survive in normally chlorinated pool water for days, can be inadvertently ingested by healthy swimmers when they swallow water. Crypto can be destroyed by supplemental pool treatment consisting of ultraviolet (UV) light or ozone disinfection, or by temporarily raising the chlorine level to very high values when the pool is closed, a process known as hyperchlorination. Although Crypto outbreaks increased by an average of 25% per year between 2000 and 2007, there were no significant increases post-2007, possibly signaling an increased awareness of Crypto prevention measures among the public. As CDC notes, outbreak trends are subject to at least two limitations: (1) outbreak counts likely underestimate actual incidence; and (2) reporting and review procedures changed over time, which affects the ability to compare data across years. After Crypto, the next most common cause of treated recreational waterborne illness outbreaks is Legionella, a bacterium that causes sickness when it is inhaled in contaminated water mists. Legionella causes Legionnaire’s Disease, a form of pneumonia, and Pontiac Fever, a flu-like illness with milder symptoms. Fine sprays from jets in hot tubs and spas can transmit Legionella to unsuspecting bathers. CDC notes that at least six of the eight reported deaths associated with treated recreational waterborne outbreaks from 2000-2014 were due to Legionella infections. Over the 15 years, recreational waterborne outbreaks caused by Legionella increased by an average of 13% per year. This, CDC notes, could be a function of a combination of factors, including our aging and more susceptible population, increased Legionella growth in the environment, and an increased awareness of the disease and associated testing and reporting. Pseudomonas is the bacterium responsible for swimmer’s ear infections and “hot tub” rash, a skin infection that may result from contact with contaminated water. According to CDC, the rash may be worse in areas of the body covered by a swimsuit. 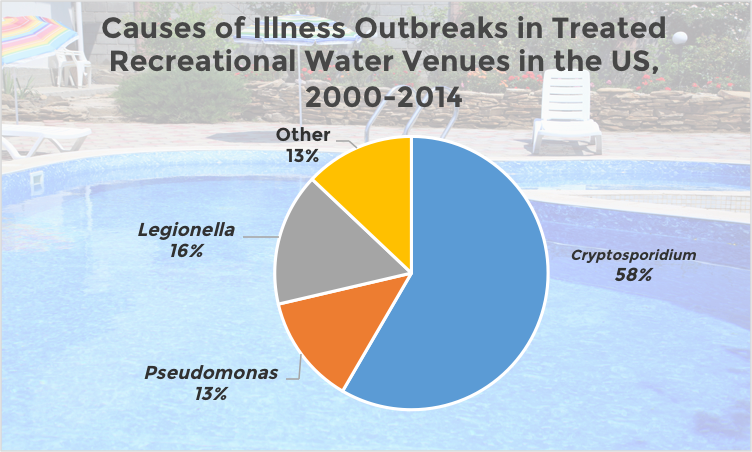 Unlike Crypto, both Legionella and Pseudomonas are susceptible to destruction by chlorine- and bromine-based disinfectants, and should not be a problem in properly maintained aquatic facilities. Outbreaks associated with Pseudomonas are down by an average of 22% per year. CDC is unsure as to whether the decline is due to fewer actual outbreaks, or rather, a focus on hot tub and spa remediation to prevent further transmission rather than investigation and reporting. We’ve made it easy! Go to the Healthy Pools website to look up the pool you are planning to visit. Do not swim with diarrhea for two weeks after it has stopped if you have a Crypto infection. Take children on frequent bathroom breaks and shower before swimming. See: You should be able to see clearly through the water to the pool floor stripes. Smell: Pools should not have a strong, irritating chemical odor. Touch: The tiles around the pool water line should feel clean, not slimy. Hear: You may hear the sound of the pool filter at work. Taste: Avoid tasting the water; swallowing even a small amount of water could make you sick. Remind children not to drink pool water! Order your free test kit and use it to confirm that the pool’s pH and free chlorine level are appropriate. Taking a vacation this summer? CDC found that one-third of outbreaks from 2000-2014 occurred in hotel pools or hot tubs. Pack your pool test kits along with your swim suit to minimize the risk of infection at an aquatic center. This summer, stay aware, swim healthy, and have fun! 1 A recreational water associated outbreak is defined as the occurrence of similar illnesses in two or more persons, linked by location and time of exposure to recreational water.